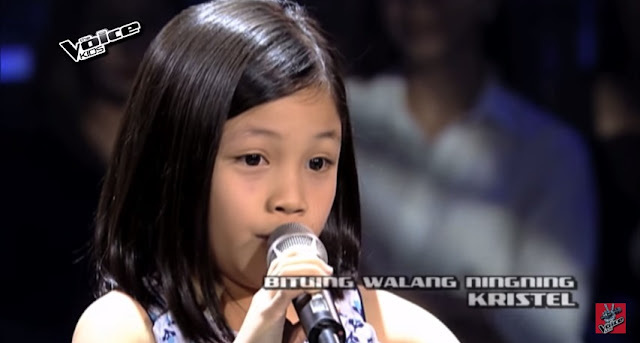 MANILA, Philippines - Eight-year-old kid Kristel Belo impressed Coach Sarah Geronimo in the sixth week of the Blind Auditions of ABS-CBN's popular vocal competition "The Voice Kids" Philippines Season 2 on Sunday, July 12, 2015. Kristel from Sto. Tomas, Batangas sang the Popstar Princess' hit song "Bituing Walang Ningning." "Nung nag-umpisa ka sa pagkanta, si Coach Sarah na ang tinitingnan ko. Nafi-feel ko na talagang idol mo si Coach Sarah," Coach Lea Salonga told Kristel. 'The Voice Kids' Season 2 dominates online conversations on Sunday with '#TVK2Olympics ' among the trending topics nationwide and worldwide.